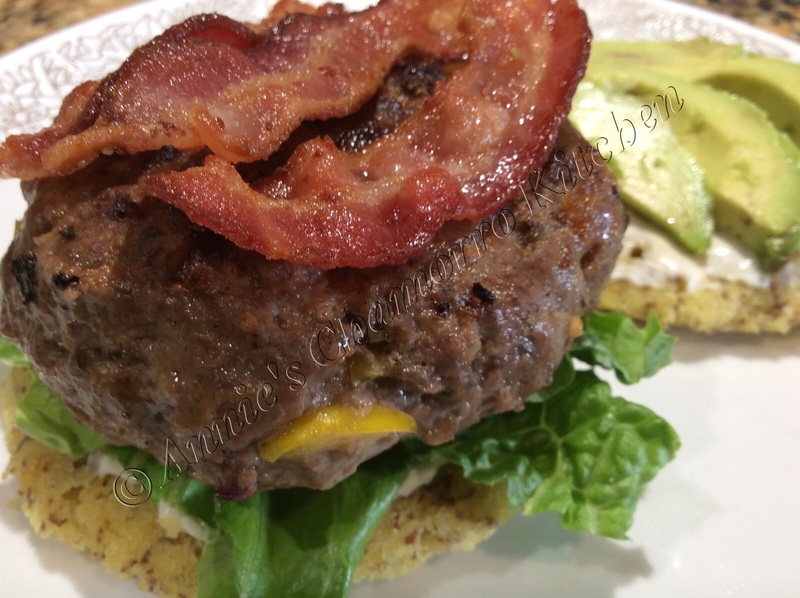 I love grilled ribs and steaks, but occasionally I crave a really good, juicy burger. I’m not talking about those flat, plain, frozen patties you can buy in bulk, and taste like cardboard after cooking. Rather, I’m talking about thick, juicy and tender burgers packed full of flavor. 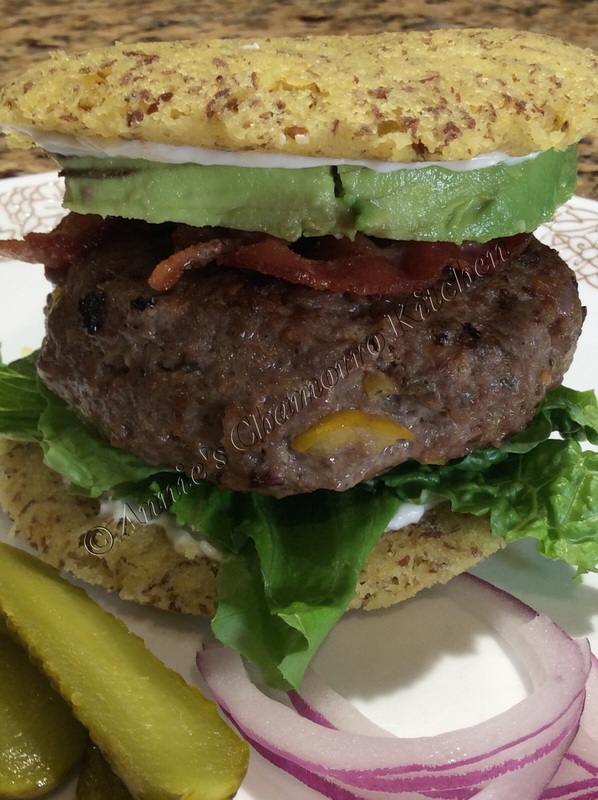 My family and I are trying to eat healthier, so I created this burger that added quality (and healthy) ingredients without sacrificing flavor. You can find my complete recipe at the bottom of this post. For THMs, this is an “S” recipe. 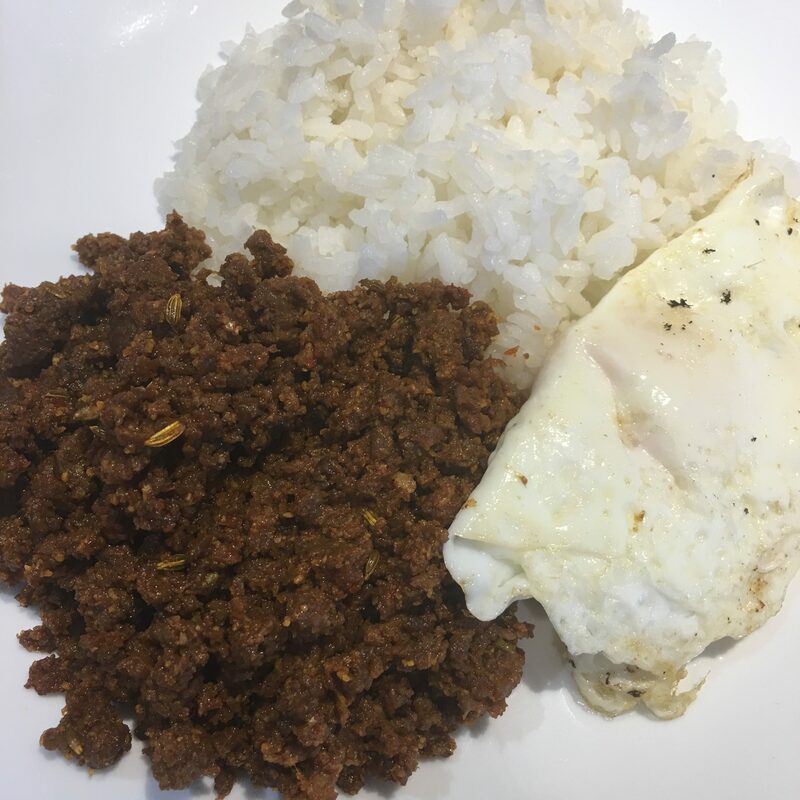 To start off, I used lean grass-fed beef. Now, this can be a bit pricey, so if this is not an option for you (or if you can’t find grass-fed beef in your grocery store), use “regular” ground beef. I also used 98% lean beef in this recipe. Now, I know what you’re thinking — how can beef that lean make juicy burgers? Well, read on and I’ll tell you. In the meantime, place the ground beef into a large mixing bowl. Most people start off with beef that’s no less than 85% lean (that means that 15% of what you buy is GROUND FAT). 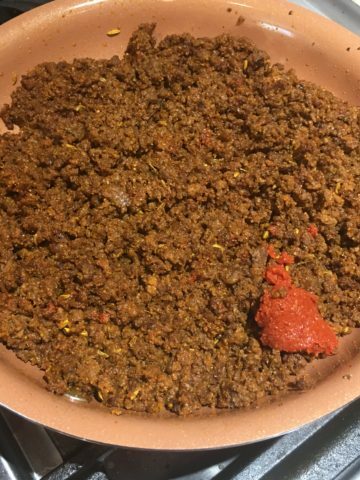 Additionally, something called a panade — a mixture of bread and milk used to keep the cooked meat tender — is also added to the mixture. Not in my kitchen. Some fat is okay, but I still stick to no less than 95% lean when I buy ground beef. 98% lean is even better. I like adding lots of flavor in the form of herbs, spices and vegetables. 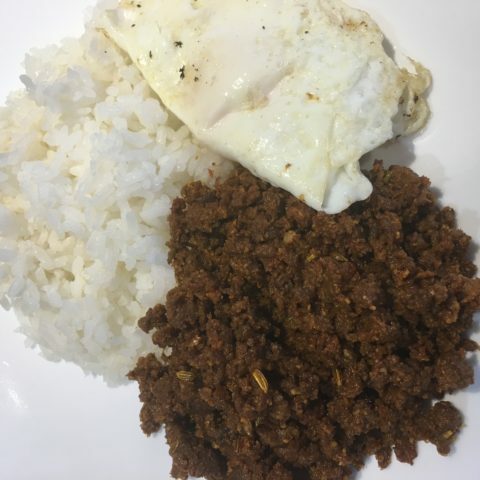 I usually use whatever is in my fridge and pantry at the time, but the staples are diced onions (I used red here, but white or yellow onions are fine), garlic, black pepper, and an egg (use one egg for two pounds of beef). Today, I also added onion powder, Italian seasoning, and rather than salt, I used a few tablespoons of powdered beef bouillon (look for one that has <1g of carbs per serving). I also added a finely diced yellow bell pepper. There’s no good way to mix this using a utensil, so wash your hands, use that elbow grease and get right in there. Mix, mix, mix. 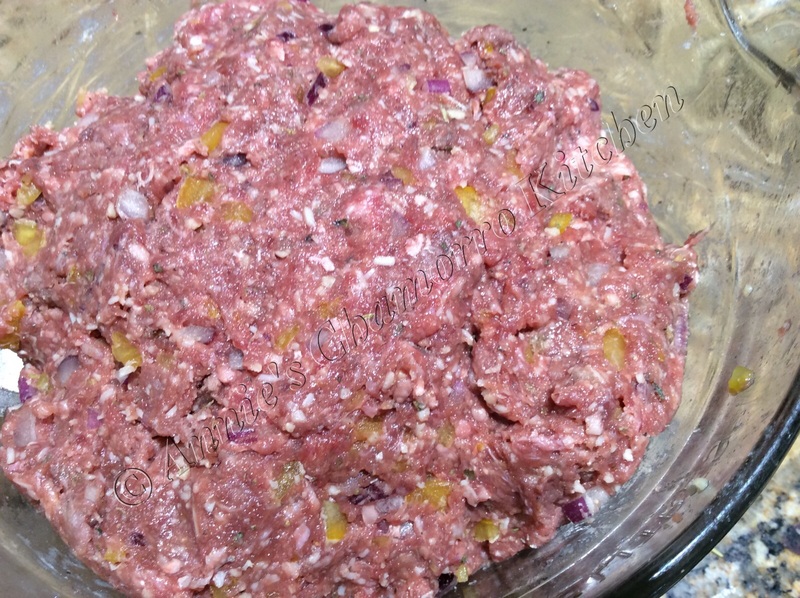 Separate the mixture into eight large meatballs. These are ready right now, as is, to flatten and cook. 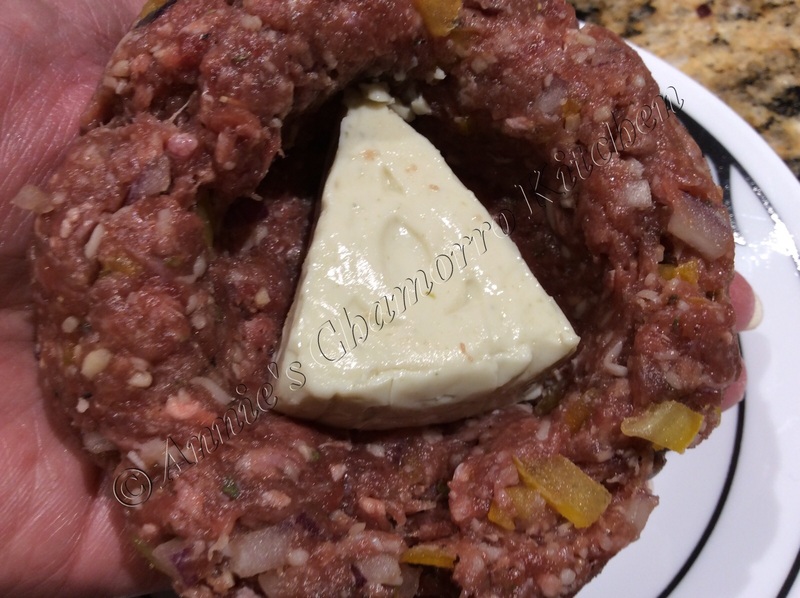 However, by my count, I’ve added just a little more than 2g of carbs per burger with the addition of part skim mozzarella and beef bouillon, so I’m thinking we can afford one more gram of carb per burger. Can you guess what that’ll be? Yes!! MORE cheese! (I love cheese, if you haven’t figured that out yet.) Not just ANY cheese, mind you, but Creamy Light Laughing Cow brand cheese. It adds just one more teeny, tiny gram of carbohydrates to the burger, so we’re up to 3g now…still within “safe” numbers per serving (and these make HUGE burgers). 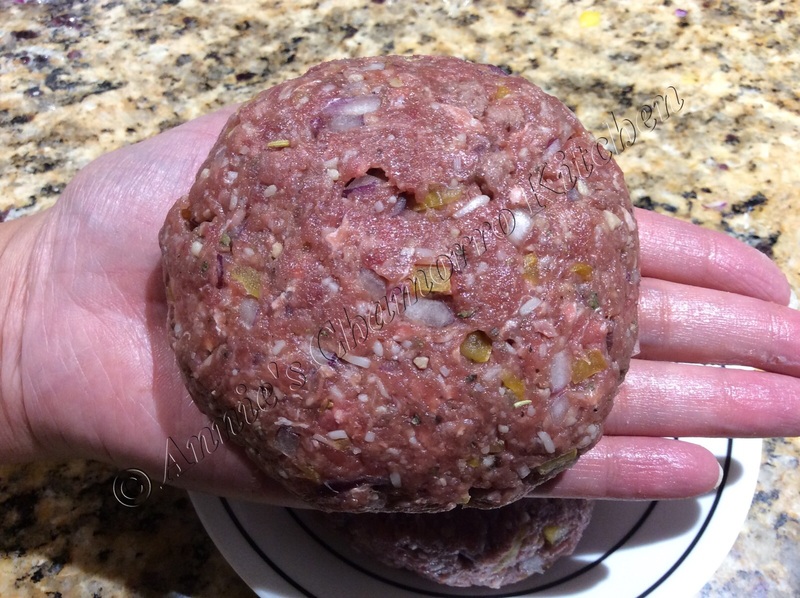 Take one meatball and make an indentation in the middle with your thumb. Make the indentation large enough to fit one wedge of Light Laughing Cow cheese. 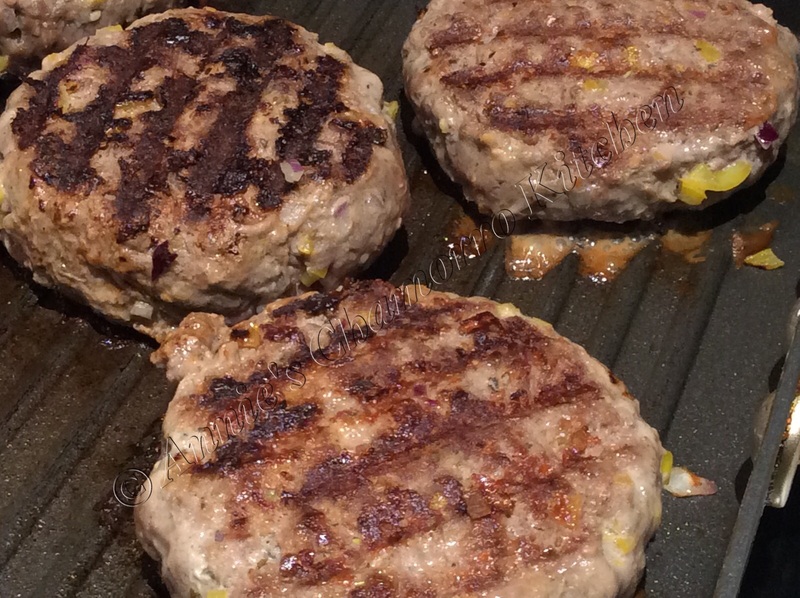 Don’t make the bottom or sides too thin or the cheese will ooze out when you cook the burger. You can leave the wedge like this but I recommend pressing it and spreading it out within the indentation you just made. Cover the cheese with the mixture, smoothing all around the sides to ensure the cheese is well-sealed within. Because of the low fat content in the ground beef, these burgers don’t shrink much during cooking. However, slightly flatten it before cooking. Cook on a hot grill pan over medium-high heat, about 5-8 minutes on each side. The burgers are done when clear juices start oozing out. 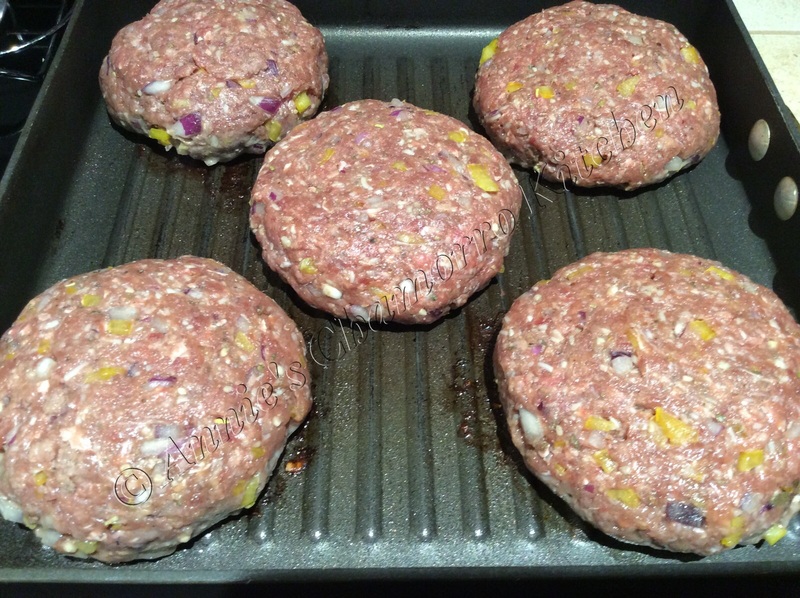 Do NOT poke or stab the burgers to check for clear juices…that will make your burgers dry out. Slightly press the top of the burger with your finger; it’s done if the burger feels slightly firm when you press on it. In case you’re wondering what type of bun that is in the photo above, it’s my gluten free, “Bun in a Bowl”. You can find my recipe for it here. For THMs, it’s an “S” recipe. 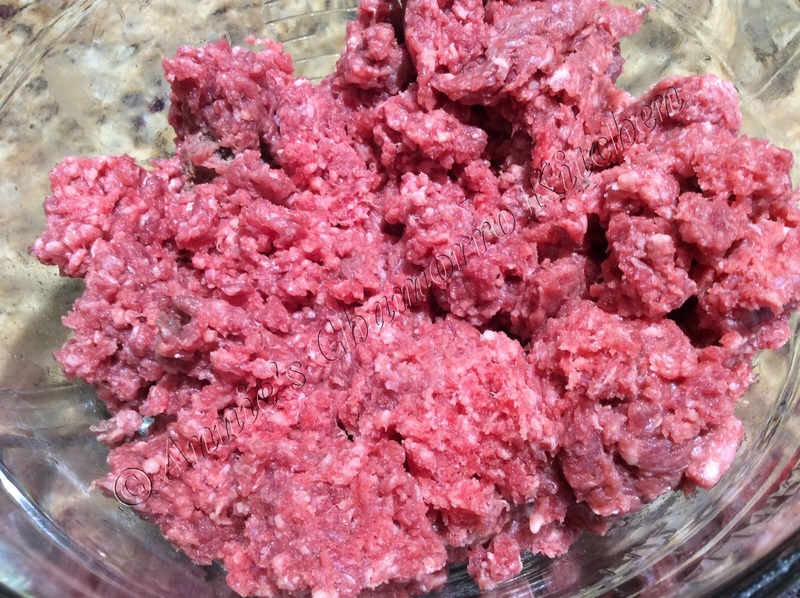 Place the ground beef into a large mixing bowl. Add the onion, bell pepper, garlic, mozzarella cheese, Italian seasoning, onion powder, beef bouillon, black pepper, and egg. Mix well. Separate into eight large meatballs. Make a small indentation in the middle of one meatball. Place one wedge of Laughing Cow cheese. Smooth the meat mixture around the cheese, sealing it in. Repeat for the remaining meatballs. 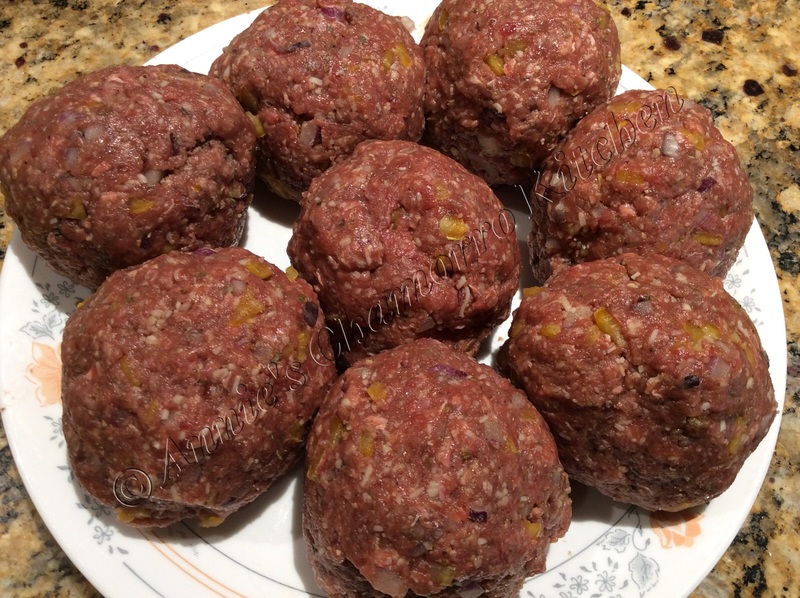 Slightly flatten each ball into a burger patty. Cook in a grill pan over medium-high heat, about 5-8 minutes on each side, or until nicely browned all around. Serve with your favorite burger add-ons and ENJOY! Don’t let the name of this dish turn you off. 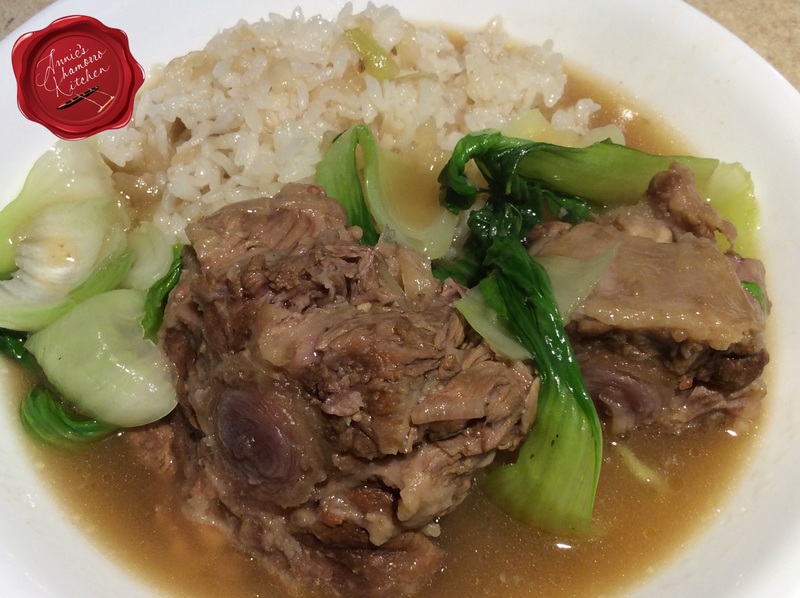 Oxtail, as the name describes, was commonly the meaty part of the tail of an ox. Nowadays, they are cut from the tails of cattle. Oxtail is quite meaty, but it requires a long and slow braising to tenderize the tough meat. You can cut the cooking time down several hours by using a pressure cooker. I prefer braising the oxtail long and slow, however, which helps to develop an incredibly rich broth. 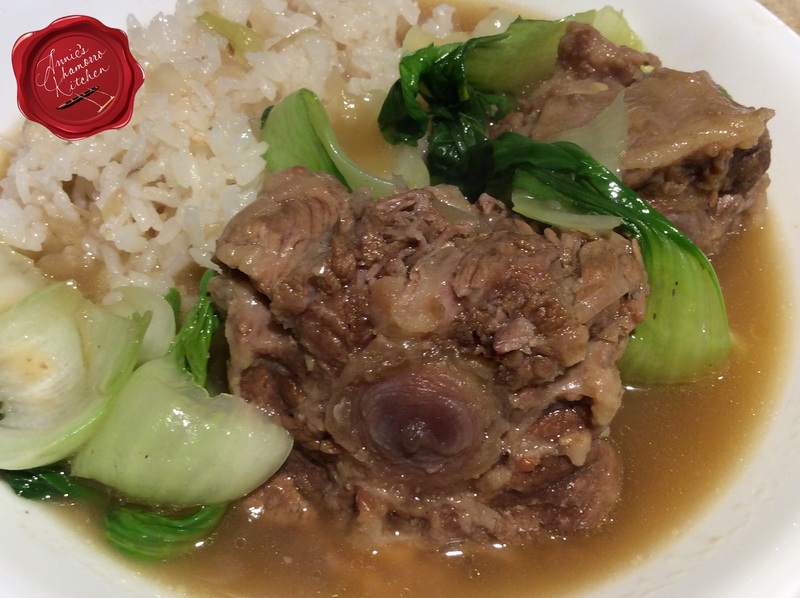 Look for oxtail with a lot of meat and not much fat. 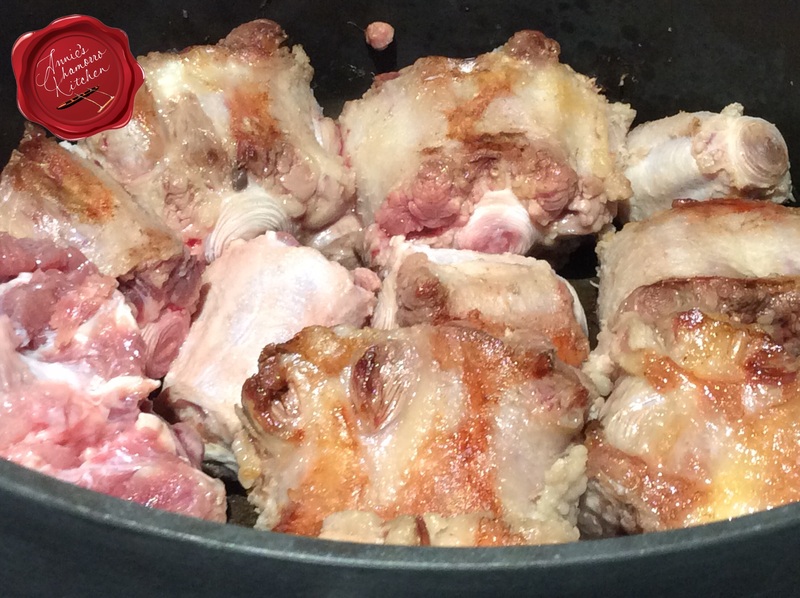 Rinse the oxtail then trim off as much fat as you can. 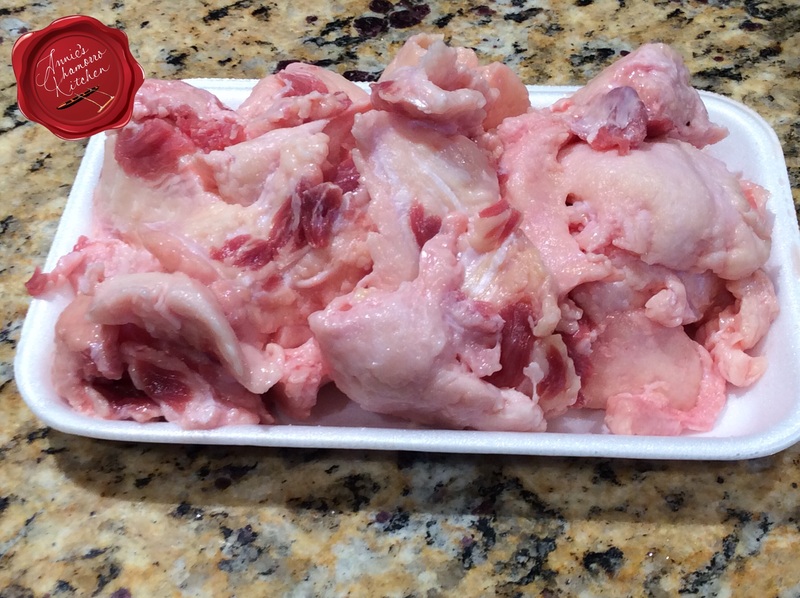 This is what I trimmed off from 5 packages of oxtail (with about 4 oxtails per package). 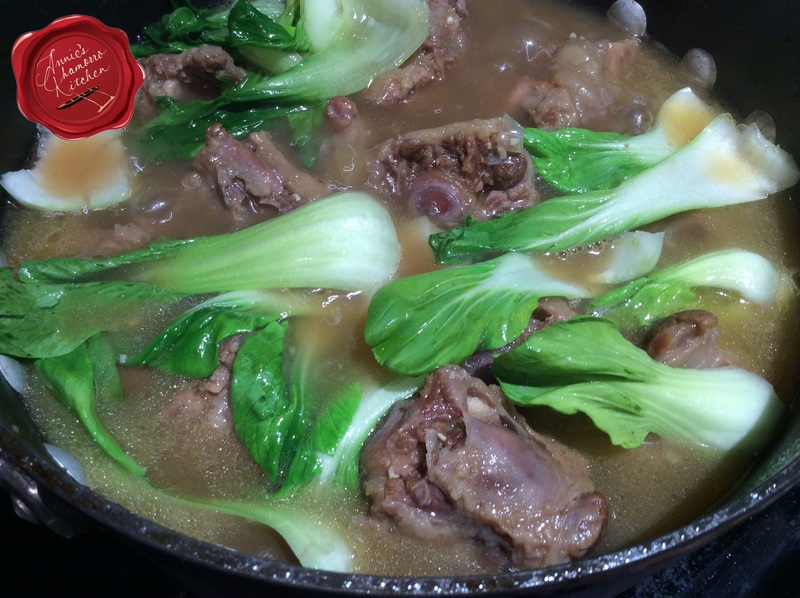 The richness of your broth starts by browning the oxtail. I did this in batches so that I could turn each oxtail over to ensure even browning. Browning creates amazingly delicious flavor compounds that ultimately gives the resulting dish an extremely rich, deep flavor. Don’t skip the browning process; trust me. The next step to developing that incredibly rich flavor is to brown your aromatics. Do this BEFORE adding any liquid. Add onions, garlic and black pepper to the pot. Do this when you have just one layer of oxtail in the pot. Set the rest of the browned oxtail aside for now; you’ll add it back to the pot in a few minutes. Cook the onions just to the point where they become a golden brown and begin to caramelize. Now the magic begins. Add the rest of the oxtail back into the pot then pour in enough water to completely cover the oxtail. Place a lid on the pot and cook over medium-low heat. If you decide to braise the oxtail long and slow, plan ahead as this will take several hours — I braised mine for about 5 1/2 hours over a slow boil. A note about boiling meat: As meat boils, a foamy substance forms on the surface. This is called scum. The scum is denatured protein. It is harmless, and eventually the foam breaks up and disperses into the stock. Although harmless (and flavorless), the scum leaves the broth gray and cloudy. Every so often, skim the surface, removing the scum. Every 30 minutes or so, at about the same time you skim the scum off the broth, check to ensure the level of liquid stays above the meat. Add enough water to maintain the level of liquid above the oxtail. Keep doing this for the first three hours. After hour number three of braising, add my secret ingredient (shhh…don’t tell anyone): half a bottle of marsala wine. Marsala wine adds deep, savory notes to the broth. After adding the wine, if the level of liquid is still not above the meat, add more water. Continue to cook over medium-low heat for another two hours. After five hours of braising, taste the broth. Add salt and pepper, to taste. Instead of salt, I like adding a few tablespoons of Dashida seasoning. If you can’t find Dashida (a Korean beef-flavored powdered seasoning), use beef bouillon. Taste and adjust the seasonings to your liking. Add your favorite vegetables during this last 30 minutes of cooking. Sometimes I add potatoes and carrots, or squash (a favorite). Baby bok choy is another favorite. Squash cooks quickly, so add it last to prevent overcooking them. Baby bok choy cooks in just a few scant minutes, so add them at the very end, just before serving. Brown the oxtail in batches over medium-high heat (brown one layer of oxtail at a time). Set the browned oxtail aside. Add the onions, garlic and black pepper to the pot. Cook until the onions begin to caramelize. Return all of the oxtail to the pot. Add enough water to cover the oxtail. Cover the pot and reduce the heat to medium-low; simmer for 5½ hours, skimming the scum off the surface periodically. Keep the water level above the meat throughout the braising. After three hours of simmering, add the wine to the pot. Simmer for 2½ more hours. Add the Dashida. Taste the broth then add salt and pepper to taste. Add any vegetables last, cooking until the vegetables are done to your liking. These little pillows of delight are delicious as a snack, appetizer, or served with your favorite soup or meal. 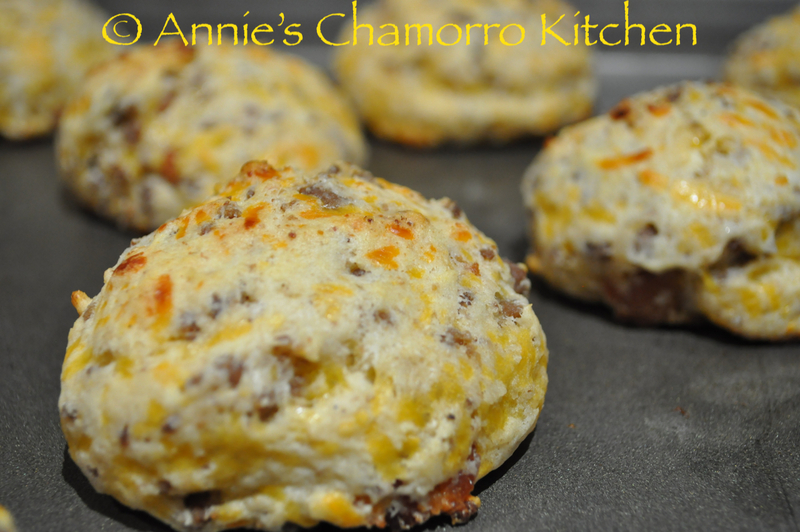 Fluffy biscuits loaded with cheese, seasoned ground beef and BACON! 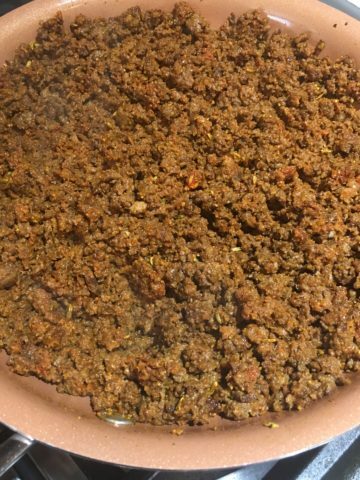 Brown the ground beef with the Dashida seasoning; set aside to cool. Cook the bacon until crisp. Crumble the bacon into small bits; set aside. Reserve about 2 tablespoons of bacon fat. 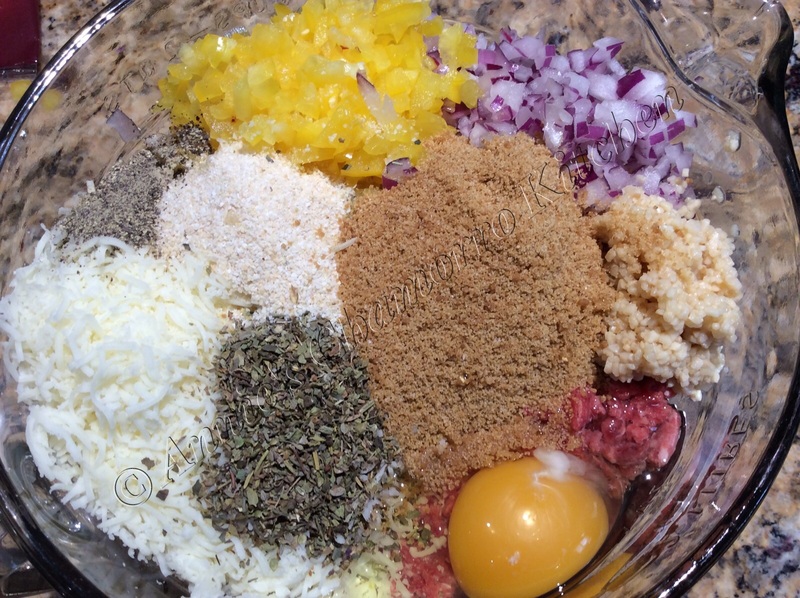 In a large mixing bowl, mix together the cooked ground beef, bacon bits, Bisquick mix, baking powder, and cheese. Fold in the reserved bacon fat, mayo, and sprite. Mix GENTLY, just until all ingredients are incorporated (do not overwork the dough). Using a large ice cream scoop (I used one that holds ¼ cup), scoop out balls of dough, placing them on a baking sheet 1 inch apart. Bake at 450 degrees for 10 minutes. Note: The cooked biscuit will feel slightly soft when the baking time is finished; do not be tempted to cook them longer, however. You are most likely feeling how soft the biscuits are because of the melted cheese. Immediately remove the biscuits to a wire cooling rack. Enjoy as a snack or with your favorite soup or meal. 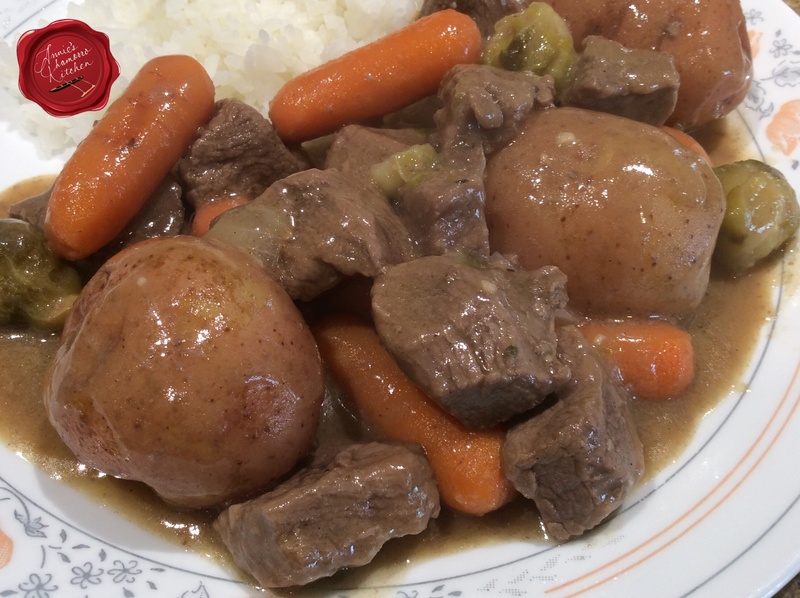 Beef stew is a comfort dish that everyone should know how to make. That and chicken soup — both are recipes you should have in your cooking repertoire. 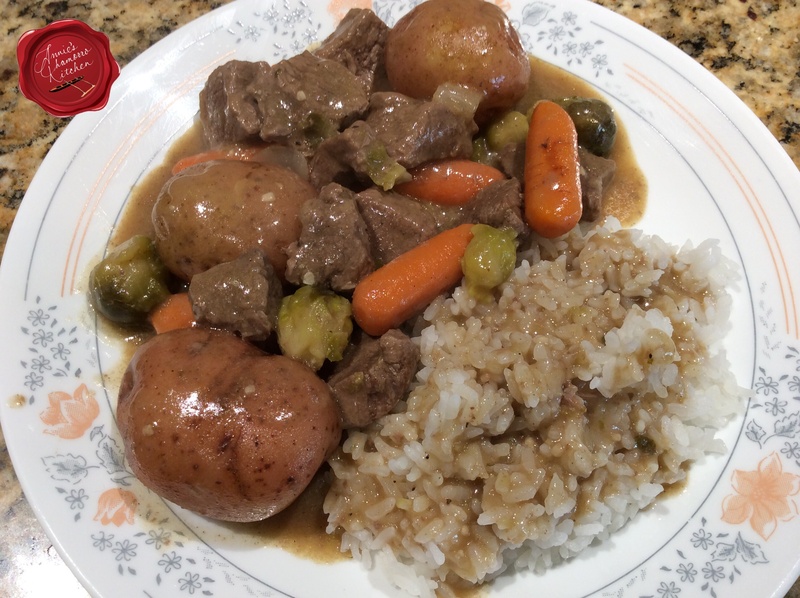 It’s not that difficult to put a beef stew together — you just brown some meat and throw in some vegetables, right? Wrong. 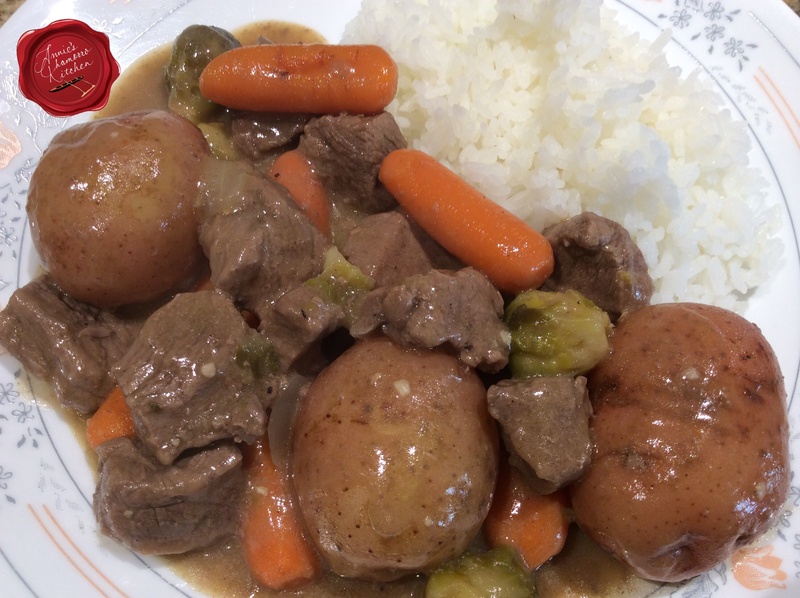 While not difficult to make, the order in which you cook your stew, and the seasonings and flavorings you add make the difference between a “WOW” and an “EHH” stew. The first layer of flavor comes from browning good quality beef. I like using a top sirloin, but any good lean beef (a bit of marbling is okay) will do. Don’t just throw the meat into the pot and crank up the heat. Think of this as building a masterpiece. Right from the get-go, you’re building up the flavorful dimensions in this classic comfort dish. Add the meat to the pot, along with some aromatics…in this case, garlic, freshly ground black pepper, salt, ground thyme and butter. 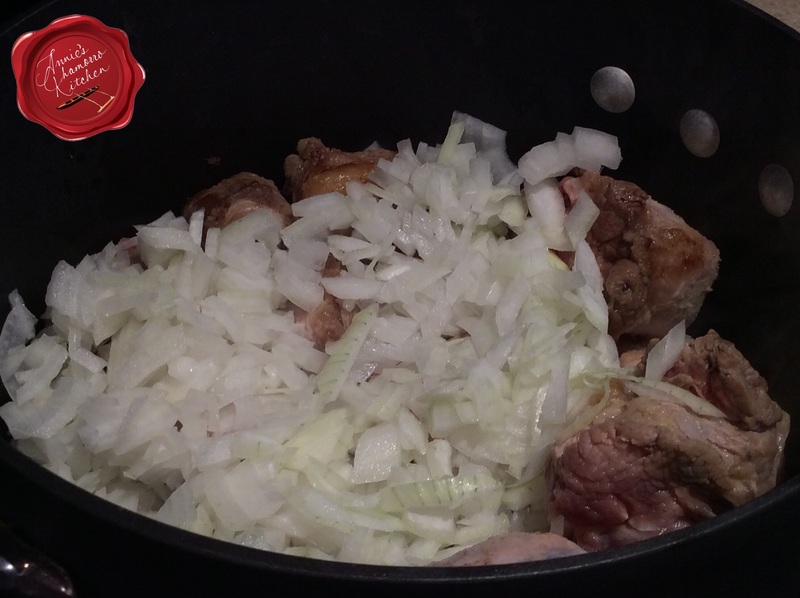 Give the mixture a stir then let the meat and aromatics cook for 5 minutes over high heat. The browning of the meat also adds great depth of flavor, which is what you want. Do not add the liquid right away or you’ll have boiled meat soup instead of a rich and hearty stew. After the meat is nice and brown, and you’ve begun to build you base flavor, it’s time to add the liquids. 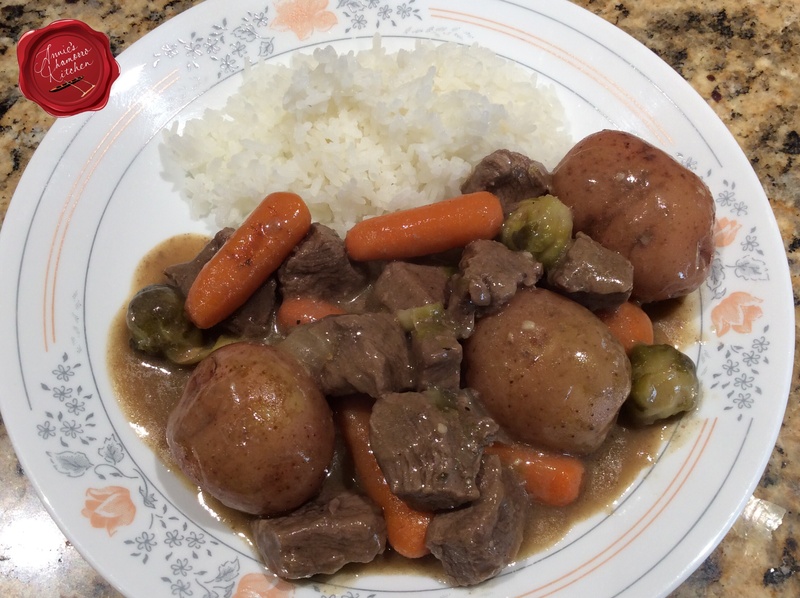 A good beef stew uses some sort of wine. I recommend using a good quality red wine, burgundy if you have any. Don’t use the “cooking wine” you find in the salad dressing section of your grocery store. A good rule of thumb for cooking with wine is to use wine you like to drink out of a glass. Mix together some water, wine, and my secret ingredient (shhhh…don’t tell anyone), orange juice. See the flavor combinations going on here? 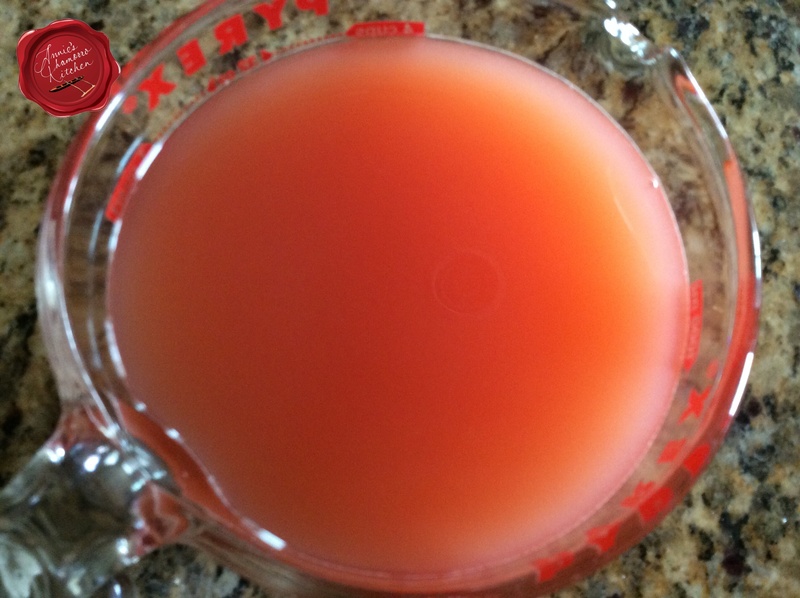 I like adding orange juice to cut back on the strong flavor of the wine (my kids don’t like too much wine in my cooking). Add the wine mixture to the pot. Now it’s time to create even more layers of flavor that will deepen with prolonged simmering. Turn your heat down to low, place a lid on the pot, and go away for two hours. Read a book. Catch up on your favorite television shows. Walk the dog. Do something but do not uncover that pot. Let the meat, liquid, and aromatics simmer happily, undisturbed. In two hours, the meat will get nice and tender. Right about the two hour mark, make the roux. 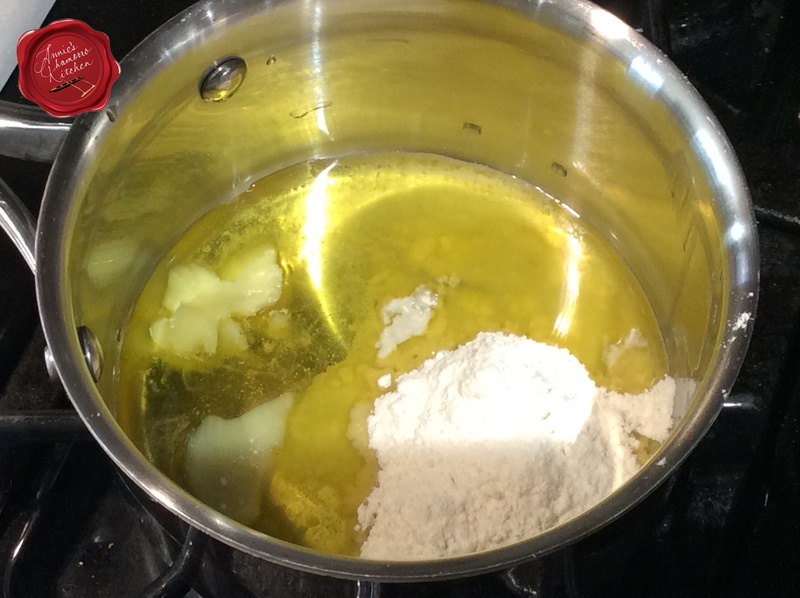 This butter-flour mixture works to thicken the broth and add a richness because of the butter. Butta is betta. ‘Nuff said. 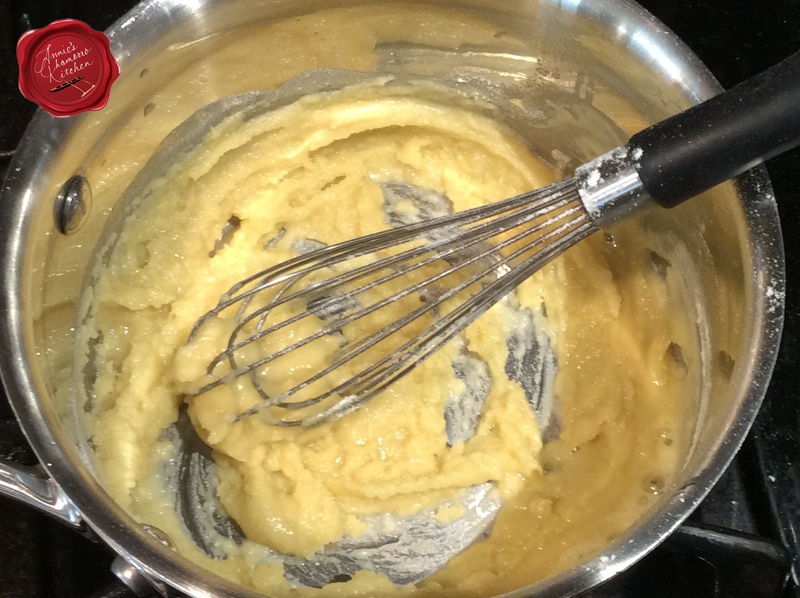 Melt some butter in a small sauce pan then add a few spoonfuls of flour. Cook over medium-low heat, stirring constantly until the mixture begins to turn a golden brown. Pour in some of the broth from the pot — about 1 to 2 cups will suffice — whisking constantly to prevent lumps from forming. If the mixture seems too thick, add more broth until you get a relatively creamy mixture (the photo below, on the right, needs more broth). Add the roux to the pot, stirring to dissolve the roux into the broth. 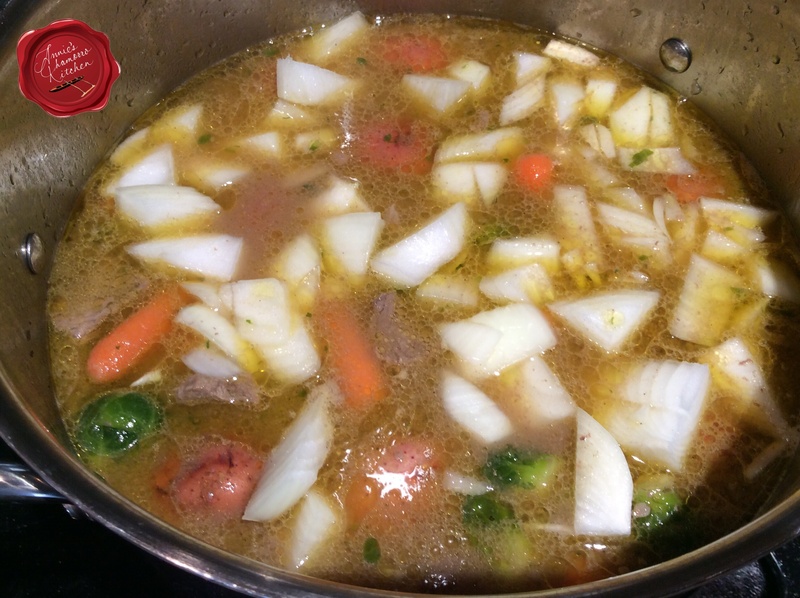 Add the additional beef broth. Add your vegetables to the pot. All at once. Go ahead. Don’t be skurred. Well, I take that back. Add the root vegetables first (potatoes, carrots) and let them cook for a few minutes before adding any other vegetables that cook quickly, like onions and in my recipe below, brussels sprouts. Turn the heat back up to high and cook for about 10 more minutes, or until the potatoes and carrots can be pierced easily with a fork. I like using petite red potatoes because they are small enough that I just have to wash them then throw them into the pot. You can cut them in half if you want to cut down on the cooking time, but after two hours of simmering, what’s another five minutes of cooking? Stir occasionally; the broth should be a nicely thickened gravy by now with the addition of the roux. Taste the gravy; add salt and pepper to taste. 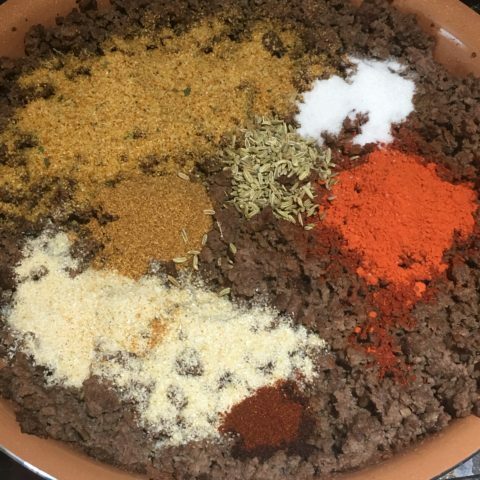 I like adding Dashida beef flavored seasoning instead of salt. Serve with hot steamed white rice. If you’re like me, you’ll need to drown your rice in some of the delicious gravy. 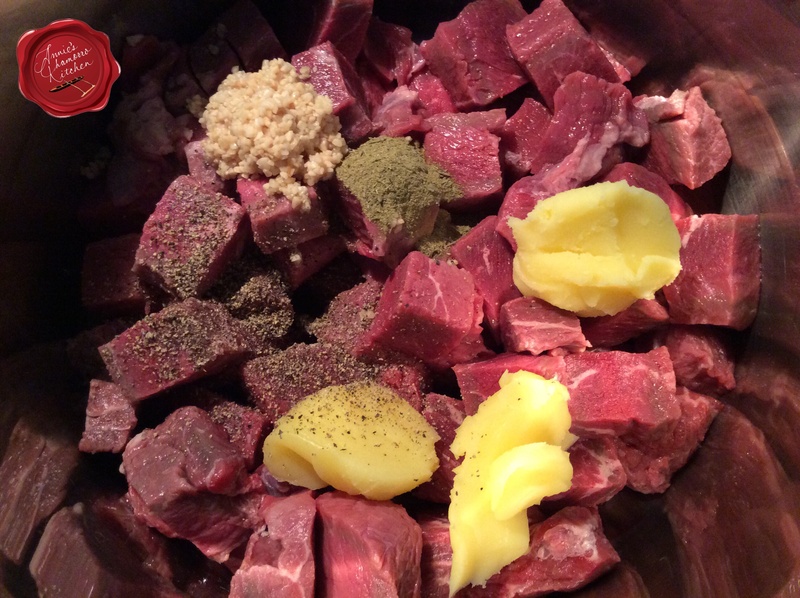 Place the meat, butter, chopped garlic, ground thyme, black pepper and salt into a large pot. Cook over high heat until the meat browns, about 5 minutes. Add the water, orange juice, and wine; reduce the heat to low and simmer for 2 hours. After 2 hours, prepare the roux. In a small saucepan, melt the butter and add the flour. Stir constantly while cooking over medium heat until the mixture begins to brown. Whisk in the broth from the pot of stew. Turn the heat off; whisk the roux into the remaining broth in the pot. Add the beef broth; stir. Add the carrots, potatoes and onion. Let this cook for a few minutes then add the brussels sprouts. Return the heat to high and cook for 10 minutes or until the potatoes are easily pierced with a fork. Taste the gravy and add salt and pepper to taste, or add Dashida. Serve with steamed white rice and enjoy!